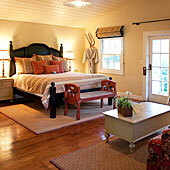 If you are planning a trip to Napa Valley and are tired of hotels, you might consider "The Cottages of Napa Valley". This is a collection of restored early California cottages with a high end "country" feel that is in good taste and not too cutesy. 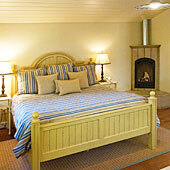 They are self catering, have private little patio gardens with outdoor fireplaces for cool evenings. They are one very good reason to make Yountville home base for your trip to Napa Valley, the wineries, tastings, the cuisine, balloon rides and almost anything else you can think of. You can cook all your meals or just have control over some of them. The kitchens are quite adequate for both. Back in the '40's Gable and Lombard made this a romantic destination, their secret hideaway. The delightful private cottages are upbeat and feature upscale amenities including complete cooking facilities that are fully equipped with all the tools you might need, fridge and Peet's coffee with several different coffee makers to suite your coffee style! It is just a few minutes away from Yountville and yet is in the country and quiet and peaceful. It is enough off the highway 29 not to hear the traffic, yet close enough to the entrance to be able to jump on this main route into Napa Valley and get anywhere quickly. The Silverado Trail on the other side of the valley used to be a much faster route and probably in high season still is, but others have discovered it too. There are eight master-suite cottages about 450-500 sq ft in size and have a king-sized bed and queen sofa bed, heated bathroom floors, large soaking tub / shower combination, wireless internet, Bose music system for CD's and ipods, cozy indoor gas fireplace, plush bathrobes & slippers, outdoor wood fireplace and a couple of Adirondack chairs to sit in front of the flames and enjoy the evening as it settles into night. 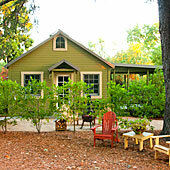 The larger cottages have jacuzzi jet bathtubs and a separate walk in shower. This is a great place from which to launch your Napa Valley activities and then come home to simply relax and yet control your meals in your own way. A breakfast basket (gluten-free breakfast options available upon request) delivered to your front porch each morning with freshly baked pastries from Bouchon Bakery in Yontville. There is also complimentary dinner transportation into Yountville from 5:00-10:00 nightly.